‘Tis the season, and thanks to their teachers, the second graders at Ocean Beach Elementary School are bursting with pride at the opportunity to brighten the day of some less fortunate children. For the past three weeks, the students in Joy Wilson’s class have been practicing their reading skills in preparation for recording various Christmas stories onto CD’s, which will then be distributed to some sick children who are cooped up at Rady Children’s Hospital. The project was the brain child of student teacher Chantel Doré. Ms. Doré explained that as a child she had a friend who was hospitalized for an extended period, and she remembered how lonely her friend was, especially during the holidays. She also recalled how helpless she felt that there wasn’t more she could do to comfort her ailing compatriot. Fast forward to today where she and Mrs. Wilson are inspiring their students to reach out to other kids who are in a less fortunate circumstance than they are. After two weeks of practice, the students were ready to record their voices for the benefit of their newfound friends. The 20 students in Mrs. Wilson’s class took turns reading from several different books, including two different Henry and Mudge books, How the Grinch Stole Christmas, The Christmas Santa Almost Missed, and Frosty the Snowman. Ms. Doré provided the books and CD’s for the project at her own cost. They will be delivered tomorrow (Dec. 18th) at a holiday party for the patients at the hospital, who are aware of and very excited about the special gifts that are coming their way from their new friends at OB Elementary. But the project is slyly about more than just giving to others, although that is certainly a primary goal. It is also being used as a very effective learning tool. The recordings are being used so that the students can hear themselves read the now familiar tales. Much like an athlete uses video of his or her own performance to seek ways to improve and develop their skills, by hearing their own voices played back to them the students are able to critique themselves (and each other) and better understand what their strengths and weaknesses are, and can use that information to improve their own reading skills. It also helps them to build confidence in their ability speak formally in front of a larger group. The reading project is just one of many community outreach activities being done by students at OB Elementary. 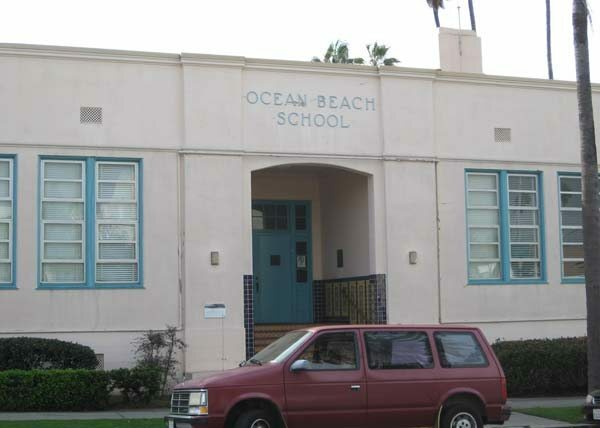 Organized by Donna Lamb, the Volunteer and Community Outreach Coordinator, the school, in conjunction with the Methodist Church and the Ocean Beach MainStreet Association, is also spearheading a holiday food and gift drive. The students have decorated collection boxes and distributed them to various Ocean Beach businesses to collect food and gifts. Needy families will receive a week’s worth of food and age appropriate gifts for their kids. The school is also recruiting “angels” who donate their time and money to shop for the families of some of the less fortunate students of OB Elementary, many of whom come from the Barrio Logan neighborhood of San Diego. In some cases the families will be provided with gift cards to Costco or Vons to purchase their own holiday meals and gifts. It is all a part of the effort to instill a sense of community into the children; a spirit of cooperation and giving that represents the very essence of Ocean Beach. Andy- your article made my day. There is so much going on around us that causes anger & despair. OB Elementary is pure joy. Kids who care. Teachers who care. And they are willing to work for something that is important to them. Thanks Andy! gosh, this article’s been up for a few hours and there’s no bitching about the San Diego School system and the teachers union. Awesome piece, Andy! Mrs. Wilson and Ms. Dore create a great environment – I was worried about my daughter going into 2nd grade after having already been one of a few 1st graders that sat in on a primarily 2nd grade ‘mixed’ class last year, but I can tell she’s still being pushed and is continuing to develop great – something I had a big problem with after advancing and then repeating material in my early education. And this project was great for the kids – we talked about it almost every day at home, and just an hour ago we sat down and read Kenzi’s part of the Grinch again – her cadence and timing compared to the jerky, stumbling manner every new reader goes through absolutely amazed me. Your daughter’s in this class? She’s lucky……I was only there for just over an hour or so, but it was pretty clear that she’s got two very good teachers in that classroom!